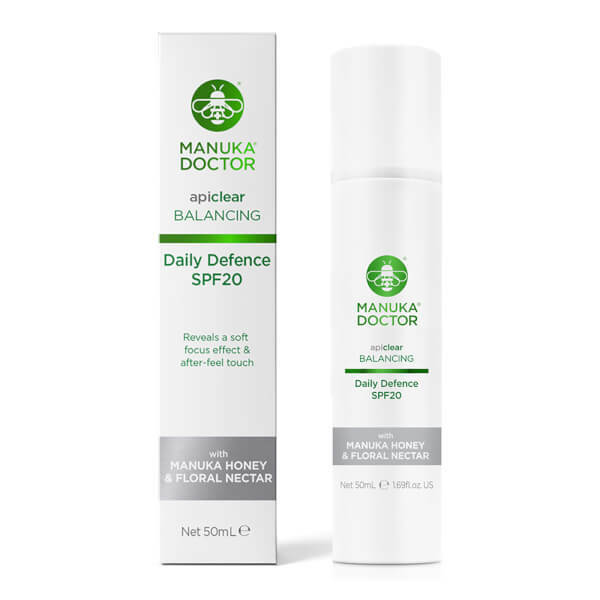 Manuka Doctor ApiClear Daily Defence SPF20 Cream is a multi-tasking beauty lotion that delivers the benefits of a moisturiser, primer and SPF all-in-one. 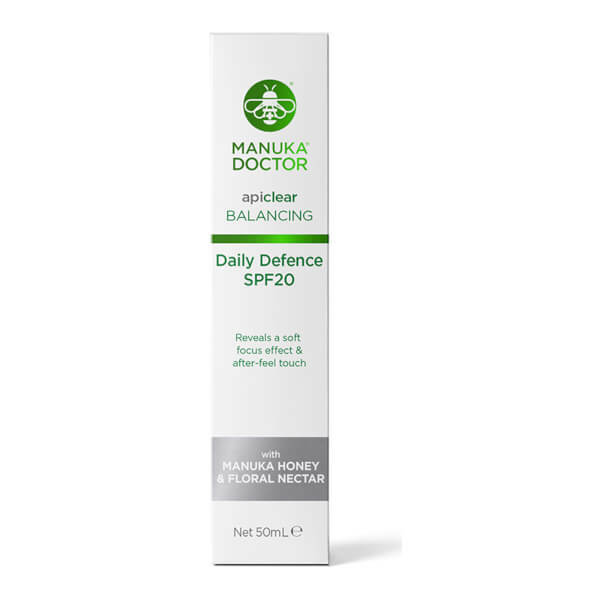 Enriched with moisturising Hyaluronic Acid and Manuka Honey, the nourishing cream works to perfect, prime and hydrate, creating a shield of protection against external aggressors while mattifying the appearance of skin with Tapioca Starch. 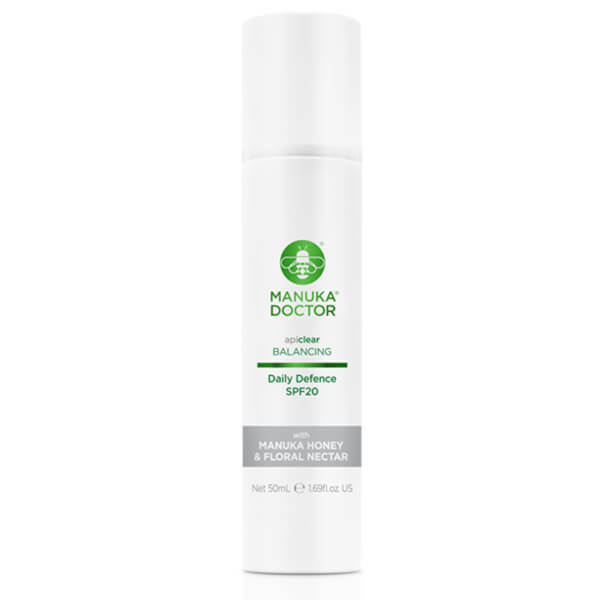 Delivering a soft-focus effect, it blurs the appearance of fine lines, wrinkles and blemishes, and uses Floral Nectar (a sweet liquid obtained from the Combretum farinosum flower) to lend skin comforting softness. Free from SLS, parabens and phthalates. Apply to a dry face and neck every day after cleansing. Methoxycinnamate, Octocrylene, Glycerin, Butyl Methoxydibenzoylmethane, Isoamyl Laurate, Caprylic/Capric Triglyceride, Glyceryl Stearate, PEG-100 Stearate, Tapioca Starch, Phenoxyethanol, Ammonium Acryloyldimethyltaurate/VP Copolymer, Sodium Stearoyl Glutamate, Benzyl Alcohol, Polysilicone-11, Glyceryl Polyacrylate, Mica, Disodium EDTA, Mel (Honey), Sodium Hyaluronate, Polyacrylamide, Limonene, Parfum (Fragrance), C13-14 Isoparaffin, Dehydroacetic Acid, Biosaccharide Gum-4, Polymethylsilsesquioxane, Laureth-7, Laureth-12, Linalool, Combretum Farinosum Flower Nectar, Ethylhexylglycerin, CI 77891 (Titanium Dioxide).